East High School’s breakfast program nourishes the community as well as the students. Here they are on an early spring morning—police officers in uniform, volunteers, a teacher—standing outside the front doors of East High School in Des Moines, 20 minutes before the Monday start bell rings. They hold open boxes of breakfast pizza, trays of fresh fruit, boxes of granola bars. Students have been trickling in for the past half-hour, and with yellow school buses starting to pull up, their numbers swell to a crush of sleepy-eyed teenagers. Before the start of a school day, Sgt. 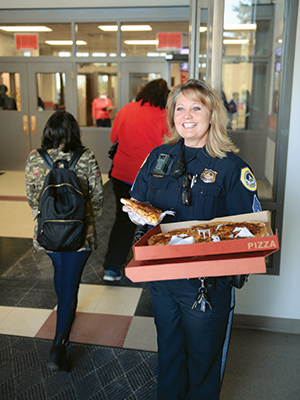 Lori Neely offers breakfast pizza—along with a welcoming smile—to East High students. To the casual observer, this has every appearance of a program to address hunger in a neighborhood with poverty rates that are nearly double that of the city as a whole—and five to six times higher than in surrounding suburbs. Indeed, that’s how the program started. 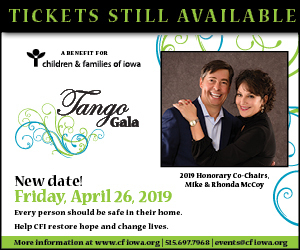 Fuel Up First, as it’s called, was launched in 2016 by the Des Moines Police Department and is supported by school staff; restaurants, grocers and local food producers; and a host of volunteers. Each Monday morning throughout the past two school years, volunteers have greeted students at the front door of the school and offered them food so they can start the week with calories to burn. But to the organizers, volunteers and experts in social change who’ve been observing Fuel Up First as it matures, the program has become much more: Though promoted as a program to combat hunger, the deeper and more significant benefit is what social scientists call “social cohesion”—the human relationships established through small, friendly exchanges like the ones heard on that spring day. Humble in appearance, these human connections can have a lifetime of benefit, according to research on children’s brain development. Just by showing up each Monday morning—by making a visible show of caring with a smile and snack—these adults and authority figures may be helping to enhance the long-term well-being of hundreds of Iowa children. The program traces its roots to surprising data found by Sgt. Lori Neely of the Des Moines Police Department. Neely had dug into juvenile arrest statistics, expecting to find that most arrests would be on early-out Wednesdays, over the lunch hour, or before or after school. While those assumptions held true, her analysis showed an unexpected anomaly. The kids weren’t getting enough to eat over the weekend, she concluded. They were coming to school hungry, and with even less than a teenager’s normal impulse control, they were getting arrested. Most of the time, the arrest would stem from an incident at school, such as a fight that could result in assault or disorderly conduct charges. Fuel Up First almost didn’t make it off the ground because a federal program already provided free breakfasts to students who met certain income guidelines. But Neely kept asking questions and discovered the federal program had limitations: There was only so much space in the lunchroom. Students were choosing sleep over breakfast, arriving to school right before class started. And there was a stigma attached to eating “handouts,” whereas with Fuel Up First, food is offered to everyone and therefore is easier to accept without being labeled. Neely is quick to give credit to the partners who helped launch Fuel Up First through their donations, grants and connections, including the Salvation Army, Habitat for Humanity, Mid-Iowa Health Foundation, Viva East Bank, East High School, Archer Daniels Midland Co., Iowa Farm Bureau, Affinity Credit Union, Hy-Vee, Roxanne Conlin, John and Mary Pappajohn, and Polk County Supervisor Tom Hockensmith. The first Monday of the program, in August 2016, the volunteers served food to 64 students. The next week, 104. Then 218, 348, 432—and quickly up to 700, 800, even 900 in the first few months. The program was in full stride. Since then, Fuel Up First has continued to grow steadily, with 600 to 1,000 students being served each week. The fluctuation in the number reflects the food available through donations on any given week. In a matter of weeks, volunteers began noticing changes in their interactions with students. At first, many of the students gave them wary looks and asked them what they were doing. And why? But as the students became accustomed to the regular presence of volunteers, they were more likely to make eye contact, say hi, even strike up a conversation. The program had become something more than food. It may be tempting to romanticize such relationships, easy to imagine a friendly encounter leading to a deep friendship. There are instances of this, but they’re the exception—and beside the point. The relationships of value here are much more ephemeral—but happening hundreds of times each Monday. A student notices that a certain volunteer isn’t there that week. A student comes back and asks for one more burrito—then a second, third and fourth. A student who had a run-in with police over the weekend, and had some of his things confiscated, seeks out a police officer he’s familiar with through the program and asks her for advice on how to get his things back. Two years after starting Fuel Up First, Neely is at once hopeful and realistic about the program’s future. The number of juvenile arrests is up citywide, East High included. But Monday—started with a smile and a snack—is no longer the most likely day for police to arrest an East High student. According to Neely, there were six arrests of East High students for crimes committed on Mondays during the first year of the program. In the second year, there were zero. While the long-term results are difficult if not impossible to quantify, organizers believe Fuel Up First is having the effect it was intended to have. “It’s just important for people to feel they have some value in our community,” says Neely, who recalls bumping into several East High students off campus recently and being recognized as the officer who hands out food. They struck up a conversation. She had a rapport with them that she doesn’t think she’d otherwise have but for the relationship nourished by Fuel Up First. The evolution of East High’s Fuel Up First has been watched with interest by Erin Drinnin, who closely follows the study of childhood resilience in her role as the Community Impact Officer of Health for United Way of Central Iowa. She cites a growing body of evidence showing that adverse childhood experiences—or ACEs, as they’re called in the field—can alter a child’s brain development, with lifelong implications. Children with adverse experiences—physical, sexual or emotional abuse; neglect; violence; substance abuse; divorce; or incarceration—are much more likely to end up with chronic diseases such as heart disease, cancer, stroke and diabetes. There aren’t any magic pills to treat ACEs. But there is something simple that anyone can do: Foster relationships to reduce the possibility of such outcomes. “Having caring, stable, nurturing relationships in your life is one of the biggest buffering factors and can mitigate the effects of trauma,” Drinnin says. These relationships are significant everywhere, not just lower-income neighborhoods like those near East High. The biggest advantage of higher-income neighborhoods is the increased opportunity for people to form relationships. When United Way compared two representative neighborhoods in Central Iowa—one higher-income than the other—they found that there were 50 opportunities for kids’ recreation, team sports or private lessons in the higher-income neighborhood, compared with just eight in the lower-income neighborhood. Fuel Up First, which started as a food-focused program to address arrest rates, has matured into a program that offers much-needed opportunities to build social connections and well-being, ultimately helping address some deeper issues, Drinnen says. ‘Over the Moon’ - Grateful Chef’s chicken dish soars. What's behind our guardians of the courthouse galaxy?